Sacred Heart University hosted its 22nd annual Discovery Awards and Scholarship Dinner Wednesday at the Hyatt Regency Hotel in Greenwich. The special night honored notable individuals while raising funds for SHU's Discovery Scholar Grants program, which provides a tuition-free education to low-income students in Fairfield County. The Discovery Scholar Grants, established in 2008, allow Sacred Heart University to make financial assistance available to SHU students who live in Fairfield County and have an annual family income below $50,000. The plan provides each qualified student with 100 percent tuition coverage. 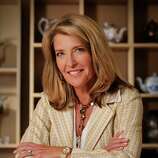 This year's honorees included Cindi Bigelow, president of R.C. Bigelow, based in Fairfield, and Robert Dilenschneider, the chairman and founder of the Dilenschneider Group of New York. Bigelow founded the annual Bigelow Tea Community Challenge, which has raised $600,000 for local charities since 1988. She spearheaded the building and development in 1996 of Sandcastle Playground, a large, wooden village playground at Jennings Beach in Fairfield that took 2,500 volunteers and $150,000 to build. Dilenschneider, a public relations professional for more than 40 years, is frequently called upon by the media to provide commentary and strategic public relations insights on major news stories. He has counseled top corporations, professional groups, trade associations and educational institutions, and has assisted clients in dealing with regulatory agencies, labor unions and consumer groups, among others. In 1991, he founded the Dilenschneider Group, which provides communication services, counsel and support in fields ranging from mergers and acquisitions and crisis communications to marketing, government affairs and international media. Dilenschneider is the author of more than a dozen books, including "A Briefing for Leaders," "Moses: C.E.O.," "50 Plus! Critical Career Decisions for the Rest of Your Life," and his latest, "The AMA Handbook of Public Relations." He is currently writing a book about notable second-in-commands and the role they have played throughout history. In 2010, Dilenschneider was honored with the Distinguished Alumni Award for "a lifetime of extraordinary accomplishments in the field of communications" from the Ohio State University School of Communication. In recognition of his contribution in promoting New York City, he received the city's Big Apple Award. In 2001, he received an honorary Doctorate of Public Service degree from Muskingum College. He is a resident of Darien. SHU's Discovery Dinner invites the community to recognize and celebrate the gifts of caring and accomplished people -- those who embody the tradition of the university in their lives. They represent a wide diversity of professions but hold in common a passion for excellence and a devotion to their fellow citizens. Each is truly an educator, showing by example the inestimable value of learning, leadership and service.